Wow, that was a great hike. The chooks--Kauai is filled with them--woke me at 4:30am which is 6:30 California time, so why not get up? Looking outside the weather was wonderfully clear, and the air was fairly dry... feels like a great day to head over to Waimea canyon area and go for a hike way up high, where it's usually cloudy and misty and drizzly and rainy. I packed a bag quickly, got out the door, yet I could not resist the Golden Arches... so I grabbed an Egg McMuffin and motivation (i.e. coffee) and started driving clockwise. Getting around any island isn't fast, and this one wasn't any different. It's not even 6:30am and still dark, but traffic was more than a bit congested; between Kapaa and Lihue they even have a reversable center lane. So much for the 'relaxed sleepy island', but I will say it feels more mellow than the very crowded Oahu or the vaguely Orange County suburban enclaves of Maui. After I drove past the Poipu turnoff, traffic really thinned out, and suddenly Kauai was a sleepy island again, chickens running across the road. The landscape dried out on the south side of the island, no more feral tropical foliage, just old sugar cane fields that are no more. 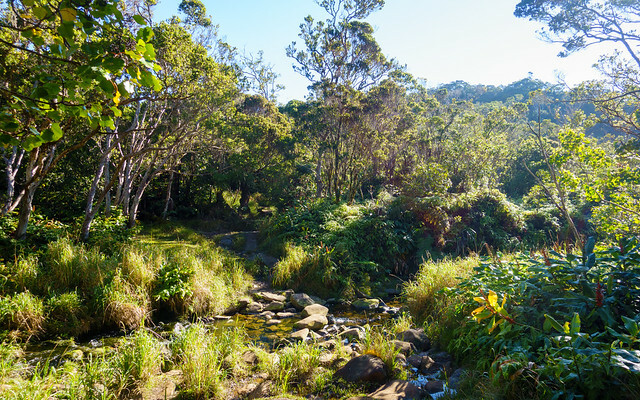 Turning inland and uphill from Waimea, the road twisted and turned through the typical weedy forest of grevillea and eucalyptus and acacia and a bit of native koa, which is after all an acacia. 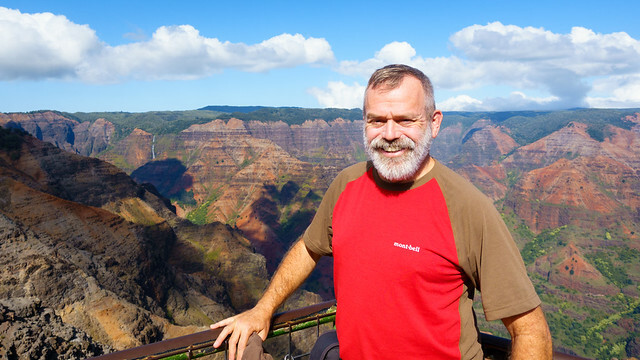 I stopped at the first Waimea canyon lookout and traded picture taking duties with the only other tourist. She wondered where the road went as it went uphill and where to go for a walk. I looked at here shoes--oooh, Chanel sandals (they make sandals? really?) -- and thought they wouldn't really last on any trails and told her about some great lookouts ahead. 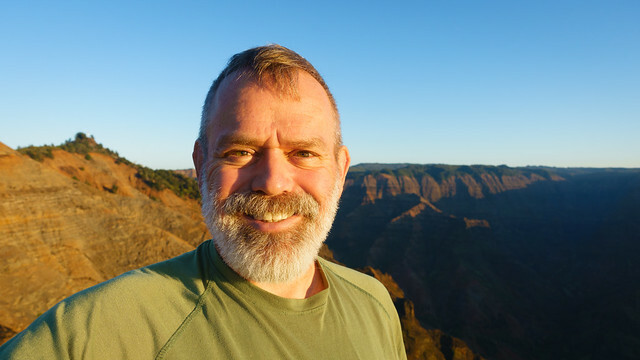 She was excited and bounced down the trail, I took Yet Another Selfie and realized it really was too shadowy for pictures looking down into the canyon depths; so much for the golden hour. At least it's quiet. I stopped at all the lookouts on the way up, each visit getting shorter and shorter--I didn't want the clouds to move in. At the last lookout, I was the only car, yay, so I got my pack on and started walking. 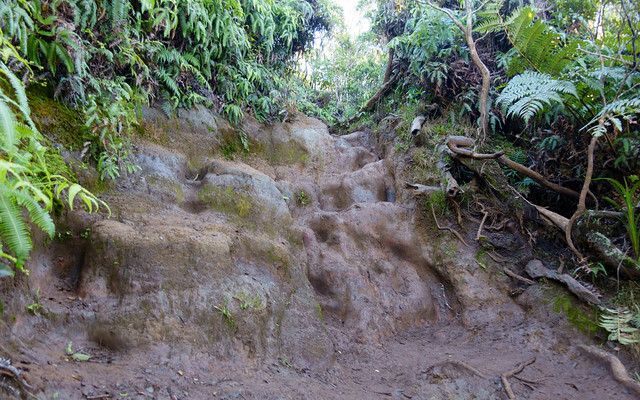 And wow, I'm super glad I brought my hiking poles--this first section of the trail to the Pihea lookout is horribly eroded, down slick reddish slopes of packed dirt, and the poles really helped. 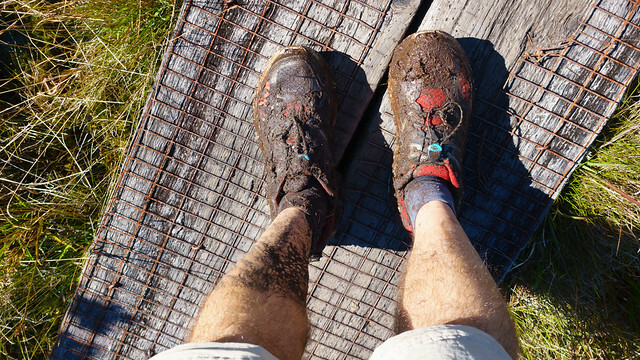 There were a few muddy bogs to work around, but generally it was just slow going more than difficult. 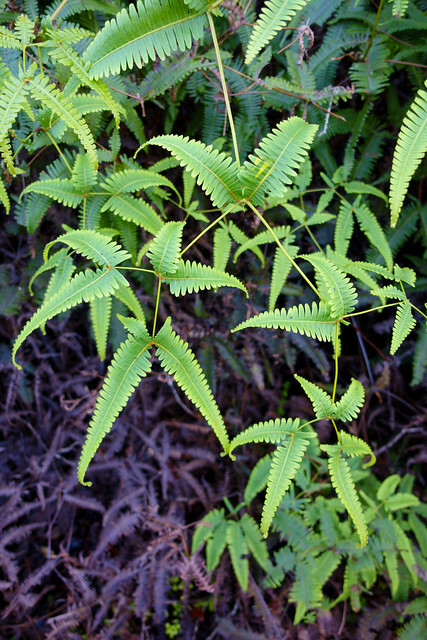 The scenery was pretty great too; the nasty weedy forest turned native, with the exception of some pesky orange flowered gingers, and maybe the pepper vines--canoe plant gone bad. 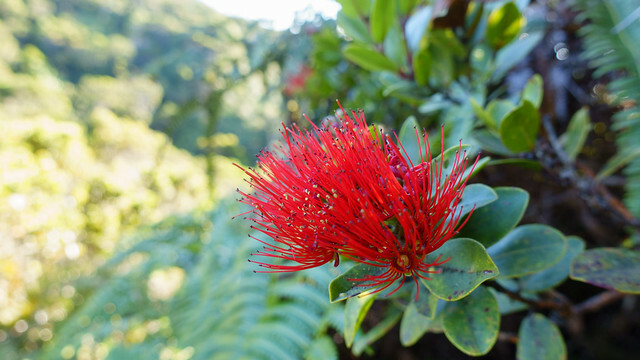 It reminded me of one of my biggest irritations about most Hawaii-lovers--they gush on and on about how pretty Hawaii is, call it 'paradise' over and over, yet most of Hawaii is really just an overgrown weedy garden with banal tropical flowers. Sure, it looks different from Wichita and Plano, but that hot mess is inherently not attractive and certainly not 'authentic' by any definition. 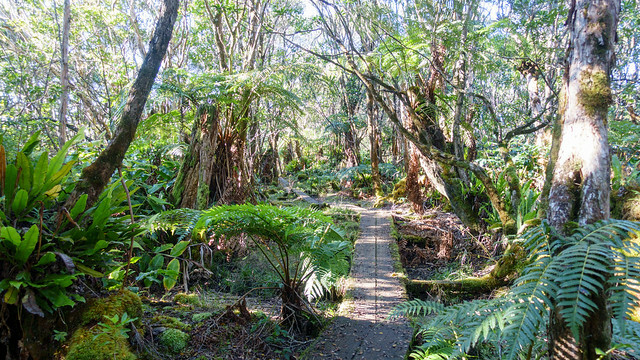 On this hike down the Pihea trail, there though was native forest, and it was reassuring to see there were still little bits of it left--the ohia trees were blooming here and there, there were native tree ferns (not the Aussie invaders), and lots of interesting plant assemblages. 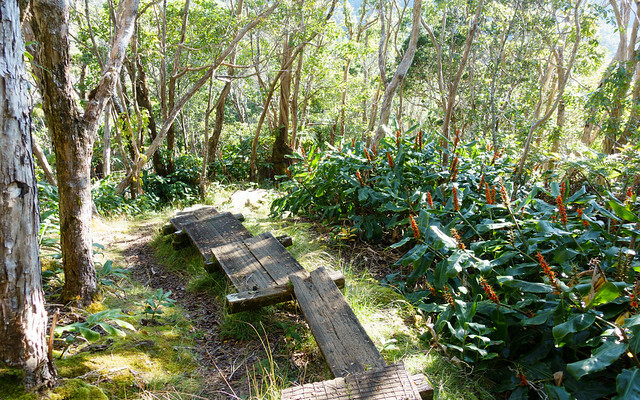 From the lookout, the trail got quite a bit better, and most of it was boardwalked. 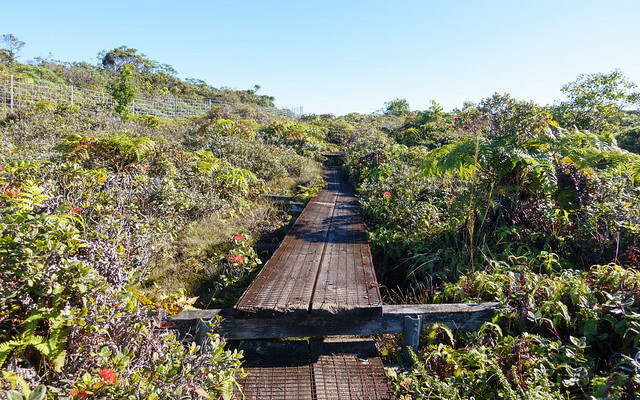 The trail dropped down to a slippery creek crossing, then up along an exclusion fence (keeping out the feral pigs) up to an odd scrubby landscape, the start of the Alakai Swamp, more hilly than swampy but I wasn't about to step off the boards. 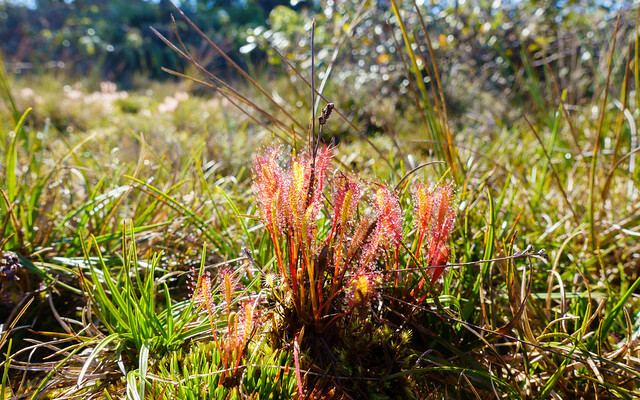 I spied some sundews along the way, definitely boggy and constantly wet. And about this time, 3 1/2 miles in, I felt like I had the island to myself. I hadn't seen anyone, I was looking over wilderness to the highest point on the island, it was great. 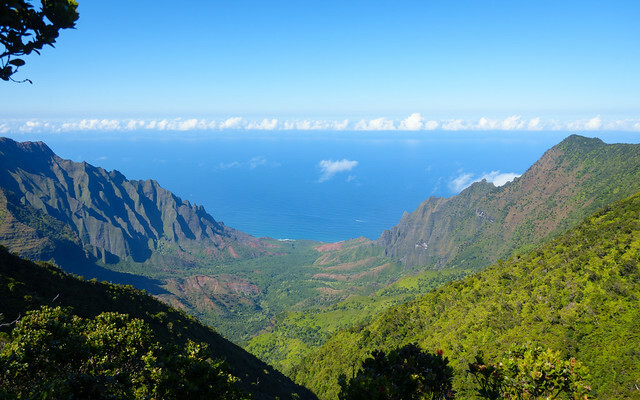 I passed more ohia trees, just knee-high now, and some odd aspen-looking trees as well, and then boom suddenly the lookout, with views for miles to the east over Hanalei Bay. It was super-pretty. And not more than five minutes later, two hikers showed up. Drat. They were Coloradans, and pleasant, but so much for my moment in paradise, it was lost. 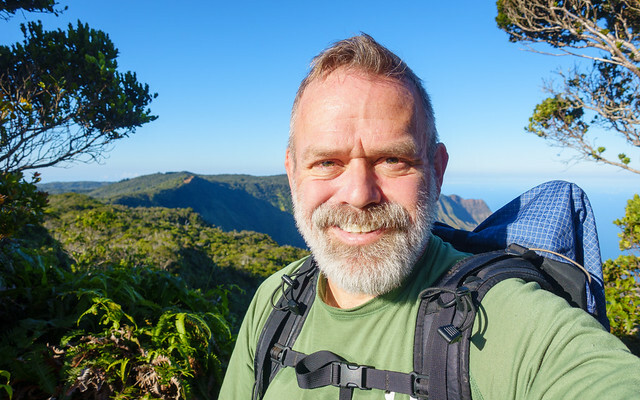 I chatted a bit, heading back the four miles to the trailhead, passing a dozen of other hikers heading to the same lookout. Ah well, good thing I got up early. And good thing I didn’t wear my sparkly flip-flops like a number of the women, or blindingly white New Balance tennis-shoes-and-white-socks combo like so many of the men. My shoes were a mess, but it was a great hike. Yep, this is one of my favorites now.